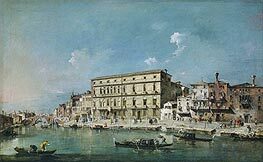 Francesco Lazzaro Guardi (October 5, 1712 - January 1, 1793) was a Venetian painter of veduta. 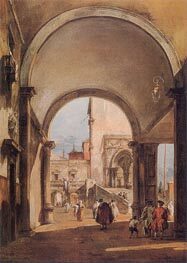 He is considered to be among the last practitioners, along with his brothers, of the classic Venetian school of painting. 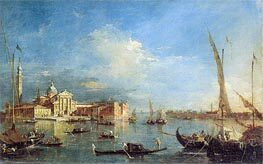 Francesco Guardi was born in Venice into a family of lesser nobility from Trentino. His father Domenico (born in 1678) and his brothers Niccolo and Gian Antonio were also painters, the latter inheriting the family workshop after the father's death in 1716. They probably all contributed as a team to some of the larger commissions later attributed to Francesco. His sister Maria Cecilia married the pre-eminent Veneto-European painter of his epoch, Giovanni Battista Tiepolo. 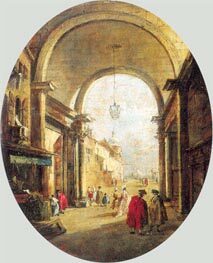 In 1735, Francesco moved to the workshop of Michele Marieschi, where he remained until 1743. 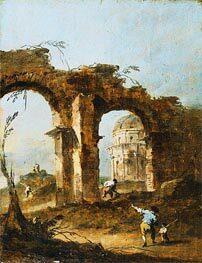 His first certain works is from 1738, for a parish at Vigo d'Anuania, in Trentino. In this period he worked alongside his better-known brother, Gian Antonio. 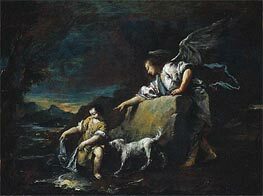 The first work signed by Francesco is a Saint Adoring the Eucarist (circa 1739). His works in this period included landscapes as well as figure representations. 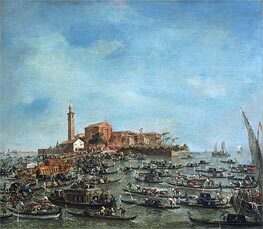 His early vedutas show influence both from Canaletto and Luca Carlevarijs. On February 15, 1757 he married Maria Mathea Pagani, the daughter of painter Matteo Pagani. In the same year his brother Gian Antonio died and his first son, Vincenzo, was born. His second son, Giacomo, was born in 1764. 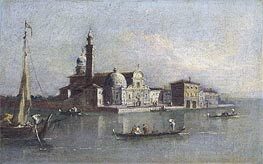 In 1763 he worked in Murano, in the church of San Pietro Martire, finishing a Miracle of a Dominican Saint clearly influenced by Alessandro Magnasco in its quasi-expressionistic style. 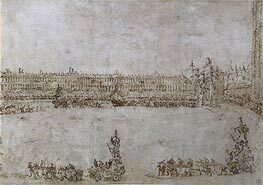 Francesco Guardi's most important later works include the Doge's Feasts, a series of twelve canvases celebrating the ceremonies held in 1763 for the election of Doge Alvise IV Mocenigo. 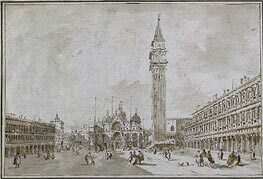 In his later years, Canaletto's influence on his art diminished, as showed by the Piazzetta in the Ca' d'Oro of Venice. In circa 1778, he painted the severe Holy Trinity Appearing to Sts. Peter and Paul in the parish church of Roncegno. 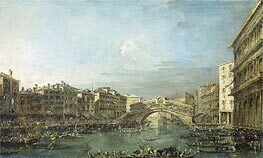 In 1782 Guardi was commissioned by the Venetian government six canvases to celebrate the visit of the Russian Archdukes in the city, of which only two remain, and two others for that of Pope Pius VI. On September 12 of that year he was admitted to the Fine Art Academy of Venice. A stronger attention to colours is present in late works such as the Concerto of 80 Orphans of 1782, now in Munich, in the Facade of Palace with Staircase in the Accademia Carrara of Bergamo. 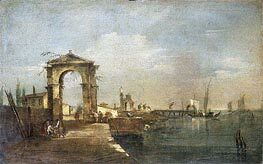 Guardi died at Venice in 1793. 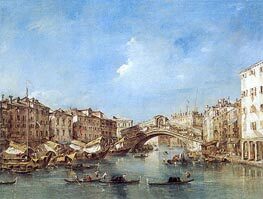 Guardi's painterly style is known as "pittura di tocco" (of touch) for its small dotting and spirited brush-strokes. 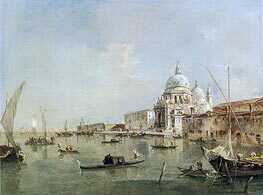 In this he differs from the more solid, meticulously etched, and architecturally accurate style of Canaletto's painting. 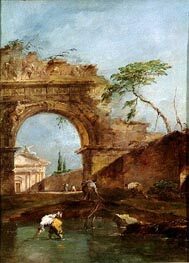 This looser style of painting also had been used by Giovanni Piazzetta and Sebastiano Ricci. 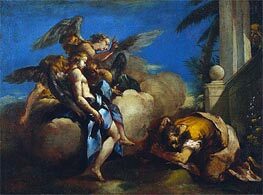 The religious paintings of Guardi also have some of sweetened sfumato of Barocci's Bolognese style. 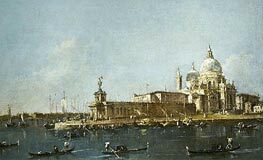 In this he differs from the more solid, meticulously etched, and architecturally accurate style of Canaletto's painting. 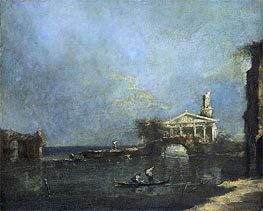 This style, centuries later, would make Guardi's works highly prized by the French Impressionists. 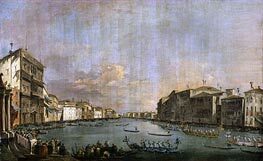 Canaletto appears to have concentrated on meticulously depicting the urban architecture of the imperial republic; on the other hand, in Guardi, the buildings often appear to be melting and sinking into a murky lagoon. 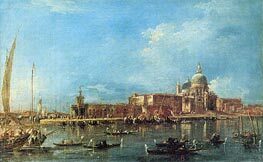 Canaletto's canvases often have intricate linear and brilliant details of urban structures, and depict Venice in sunny daylight. Guardi's skies are clouded and the time is dusk. 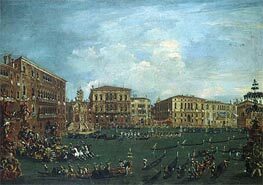 These contrasts, however, simplify the facts, since Canaletto often painted the drab communal life and neighborhoods (creating in them some epic artistic qualities), while Guardi did not avoid painting some of the now-empty ceremonies of Ducal Venice. 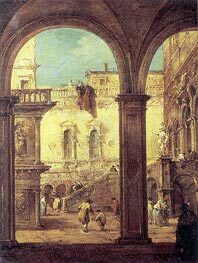 Ultimately, Guardi's paintings evoke the onset of the dissipation. 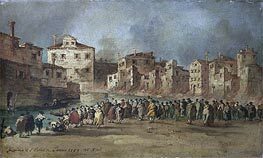 The citizenry has shrunken to an impotent lilliputian crowd of "rubber-neckers", unable to rescue the crumbling Republic, as for example in the Fire in the Oil Depot in San Marcuola. It was fitting depiction of the rapidly declining empire, which had declined, in Napoleon's assessment, into a "drawing room of Europe" peopled with casinos, carnivals, and courtesans for hire.